If the document changes its m_pPieceTable it needs to call here too. Does this document have any semantic items like contacts, events etc. Get a list of all the objects which have the given subject and predicate. Get a list of all the subjects which have the given predicate and object. Get the predicate and objects which have the given subject. Get the total number of triples in the model. Dump the model as debug messages. The single way that you can update the document RDF is through an PD_DocumentRDFMutation. Internal method: used by AbiCollab to update the RDF. Internal method: Using the supplied AP, insert into ret a list of all the objects which have the given subject and predicate. Internal method: Using the supplied AP, insert into ret a list of all the subjects which have the given predicate and object. Internal method: Using the supplied AP, insert into ret a list of every subject in the model. Internal method: tests if the AP has the triple or not. Dump the model contained in the given AP as debug messages. Change the AttrProp Index that we are using to store all the RDF. Get the AttrProp index where we are storing all the RDF. Get the AttrProp with all the RDF in it. The RDF associated with a document. 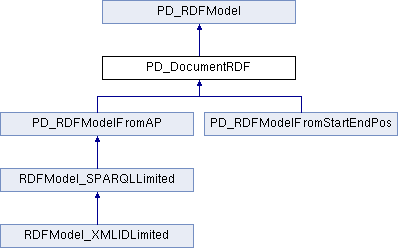 The RDFModel interface can be used to query all the RDF for this document. Use createMutation() to create an object which allows you to update the RDF in batch. To find the RDF which is associated with an element use getRDFAtPosition() and getRDFForID() which return a submodel. References PD_SemanticItemFactory::createLocation(), PD_RDFQuery::executeQuery(), getDocument(), PD_Document::getDocumentRDF(), getSemanticItemFactory(), UT_DEBUGMSG, and UT_UNUSED. References getAllSubjects(), getArcsOut(), PD_URI::toString(), and UT_DEBUGMSG. Referenced by getRDFAtPosition(), and getRDFForID(). References addXMLIDsForBlockAndTableCellForPosition(), addXMLIDsForObjects(), getObjectsInScopeOfTypesForRange(), PTO_Bookmark, PTO_RDFAnchor, and xxx_UT_DEBUGMSG. References PD_Document::getAPIFromSDH(), PP_AttrProp::getAttribute(), PD_Document::getAttrProp(), getDocument(), PD_Document::getFragFromPosition(), getPieceTable(), pf_Frag::getPos(), pt_PieceTable::getStruxOfTypeFromPosition(), PTX_Block, PTX_SectionCell, v, and xxx_UT_DEBUGMSG. References PP_AttrProp::getAttribute(), pt_PieceTable::getAttrProp(), RDFAnchor::getID(), pf_Frag::getIndexAP(), pf_Frag_Object::getObjectType(), pf_Frag::getPieceTable(), PT_XMLID, v, and xxx_UT_DEBUGMSG. References decodePOCol(), gchar, PP_AttrProp::getProperty(), and PD_URI::toString(). Referenced by PD_DocumentRDFMutation::add(), contains(), and PD_RDFModelFromStartEndPos::contains(). References decodePOCol(), gchar, PP_AttrProp::getNthProperty(), PP_AttrProp::getPropertyCount(), getTripleCount(), m_indexAP, szName, UT_DEBUG_ONLY_ARG, and UT_DEBUGMSG. Referenced by dumpModel(), and PD_RDFModelFromStartEndPos::dumpModel(). References gchar, PP_AttrProp::getNthProperty(), PP_AttrProp::getPropertyCount(), and szName. Referenced by getAllSubjects(), and PD_RDFModelFromStartEndPos::getAllSubjects(). This can be thought of as all the arcs from the node at 's' in the RDF graph. Referenced by getArcsOut(), and PD_RDFModelFromStartEndPos::getArcsOut(). Referenced by getObjects(), and PD_RDFModelFromStartEndPos::getObjects(). References decodePOCol(), gchar, PP_AttrProp::getNthProperty(), PP_AttrProp::getPropertyCount(), and szName. Referenced by getSubjects(), and PD_RDFModelFromStartEndPos::getSubjects(). References getAP(), getDocument(), and PD_Document::getDocumentRDF(). Referenced by PD_DocumentRDFMutation::add(), and contains(). This is where you get one of those. Reimplemented in RDFModel_SPARQLLimited, and RDFModel_XMLIDLimited. Referenced by getRDFAtPosition(), getRDFForID(), handleCollabEvent(), relinkRDFToNewXMLID(), and runMilestone2Test(). References getDocument(), PD_Document::getDocumentRDF(), and UT_DEBUGMSG. References apDumpModel(), getAP(), m_doc, UT_DEBUG_ONLY_ARG, and UT_DEBUGMSG. References PD_Document::dumpDoc(), gchar, PD_Document::getAPIFromSDH(), PP_AttrProp::getAttribute(), pt_PieceTable::getAttrProp(), PD_Document::getAttrProp(), pt_PieceTable::getBounds(), getDocument(), pt_PieceTable::getFragFromPosition(), pf_Frag::getIndexAP(), pf_Frag::getLength(), pf_Frag_Object::getObjectType(), pf_Frag::getPieceTable(), getPieceTable(), pt_PieceTable::getStruxOfTypeFromPosition(), pf_Frag::getType(), m_doc, PT_XMLID, PTX_Block, UT_DEBUGMSG, and v.
References getDocument(), PD_Document::getFragFromPosition(), pf_Frag::getNext(), pf_Frag::getXMLID(), and UT_DEBUGMSG. References getContacts(), getEvents(), and getLocations(). Referenced by addRDFForID(), and getTripleCount(). Reimplemented in PD_RDFModelFromAP, PD_RDFModelFromStartEndPos, and RDFModel_SPARQLLimited. References pt_VarSet::getAP(), getIndexAP(), getPieceTable(), and pt_PieceTable::getVarSet(). Referenced by begin(), contains(), dumpModel(), getAllSubjects(), getArcsOut(), getObjects(), getSubjects(), PD_DocumentRDFMutation::handleAddAndRemove(), and PD_DocumentRDFMutation::PD_DocumentRDFMutation(). Referenced by addRDFForID(), getTripleCount(), and runMilestone2Test2(). References PD_SemanticItemFactory::createContact(), PD_RDFQuery::executeQuery(), getDocument(), PD_Document::getDocumentRDF(), getSemanticItemFactory(), and UT_DEBUGMSG. Referenced by getAllSemanticObjects(), getSemanticObjects(), and runPlay(). Referenced by addLocations(), addXMLIDsForBlockAndTableCellForPosition(), begin(), PD_DocumentRDFMutation::commit(), PD_DocumentRDFMutation::createBNode(), createRestrictedModelForXMLIDs(), createScratchModel(), dumpObjectMarkersFromDocument(), getAllIDs(), getContacts(), getEvents(), getIDRange(), getRDFAtPosition(), priv_addRelevantIDsForPosition(), and relinkRDFToNewXMLID(). References PD_SemanticItemFactory::createEvent(), PD_RDFQuery::executeQuery(), getDocument(), PD_Document::getDocumentRDF(), getSemanticItemFactory(), and UT_DEBUGMSG. References getDocument(), PD_Document::getFragFromPosition(), RDFAnchor::getID(), pf_Frag::getLength(), pf_Frag::getNext(), pf_Frag_Object::getObjectType(), pf_Frag::getPos(), pf_Frag_Strux::getStruxType(), pf_Frag::getType(), pf_Frag::getXMLID(), PTX_Block, and PTX_SectionCell. Referenced by runPlay(), and selectXMLIDs(). Referenced by getAllSemanticObjects(), and getSemanticObjects(). References PP_AttrProp::getAttribute(), pt_PieceTable::getAttrProp(), pt_PieceTable::getFragFromPosition(), RDFAnchor::getID(), pf_Frag::getIndexAP(), pf_Frag::getLength(), pf_Frag_Object::getObjectType(), pf_Frag::getPieceTable(), getPieceTable(), pf_Frag::getPos(), pf_Frag::getType(), RDFAnchor::isEnd(), PT_XMLID, PTO_Bookmark, PTO_RDFAnchor, v, and xxx_UT_DEBUGMSG. Referenced by addXMLIDsForBlockAndTableCellForPosition(), PD_DocumentRDFMutation::commit(), dumpObjectMarkersFromDocument(), getAP(), getObjectsInScopeOfTypesForRange(), priv_addRelevantIDsForPosition(), setAP(), and setupWithPieceTable(). References addRDFForID(), addRelevantIDsForPosition(), createMutation(), getDocument(), and UT_DEBUG_ONLY_ARG. References addRDFForID(), createMutation(), and m_doc. Referenced by addLocations(), PD_RDFSemanticItem::createSemanticItem(), getContacts(), and getEvents(). const std::string & extraPreds = ""
Referenced by Defun1(), RDFModel_XMLIDLimited::getSparql(), and relinkRDFToNewXMLID(). This can be relatively expensive to calculate. So definately don't keep on doing it in a loop. Reimplemented in PD_RDFModelFromAP, and PD_RDFModelFromStartEndPos. References PD_Document::forceDirty(), PD_RDFModel::incremenetVersion(), and m_doc. References PD_Document::getAPIFromSDH(), PP_AttrProp::getAttribute(), PD_Document::getAttrProp(), pt_PieceTable::getAttrProp(), getDocument(), pt_PieceTable::getFragFromPosition(), RDFAnchor::getID(), pf_Frag::getIndexAP(), pf_Frag::getLength(), pf_Frag_Object::getObjectType(), pf_Frag::getPieceTable(), getPieceTable(), pf_Frag::getPos(), pt_PieceTable::getStruxOfTypeFromPosition(), pf_Frag::getType(), RDFAnchor::isEnd(), PT_XMLID, PTX_Block, PTX_SectionCell, UT_DEBUGMSG, and v.
References createMutation(), d, PD_RDFQuery::executeQuery(), getDocument(), PD_Document::getDocumentRDF(), getSPARQL_LimitedToXMLIDList(), s, PD_URI::toString(), and UT_DEBUGMSG. References createMutation(), dumpModel(), m_doc, runMilestone2Test2(), and UT_DEBUGMSG. References begin(), getArcsOut(), PD_RDFModel::getObject(), PD_RDFModel::getSubject(), getSubjects(), PD_URI::toString(), and UT_DEBUGMSG. References getContacts(), getEvents(), getIDRange(), and UT_DEBUGMSG. References XAP_App::getApp(), XAP_Frame::getCurrentView(), getIDRange(), XAP_App::getLastFocussedFrame(), FV_View::selectRange(), and UT_DEBUGMSG. References pt_VarSet::addIfUniqueAP(), getPieceTable(), pt_PieceTable::getVarSet(), PP_AttrProp::markReadOnly(), PP_AttrProp::prune(), and setIndexAP(). This is used by PD_DocumentRDFMutation to commit it's changes. In various places like PD_Document::_importFile the document creates a new piecetable and thus must notify the DocumentRDF of this change so we can update our AttrProp indexes and the like. References pt_VarSet::addIfUniqueAP(), getPieceTable(), pt_PieceTable::getVarSet(), m_indexAP, and UT_DEBUGMSG. Referenced by dumpModel(), PD_RDFModelFromStartEndPos::dumpModel(), dumpObjectMarkersFromDocument(), getDocument(), getPieceTable(), getRDFForID(), maybeSetDocumentDirty(), runMilestone2Test(), and PD_RDFModelFromStartEndPos::updateAPList(). Referenced by haveSemItems(), and updateHaveSemItemsCache(). Referenced by apDumpModel(), getIndexAP(), setIndexAP(), and setupWithPieceTable(). Referenced by getRDFDialogs(), and setRDFDialogs(). Referenced by getSemanticItemFactory(), and setSemanticItemFactory().